Credit: This resource is excerpted and adapted from Chapter 11: Appliances and Lighting in Miller, C., Sullivan, J., and Ahrentzen, S. (2012). Energy Efficient Building Construction in Florida. ISBN 978-0-9852487-0-3. University of Florida, Gainesville, FL. 7th Edition. The U.S. Federal Trade Commission (FTC) requires manufacturers of incandescent, compact fluorescent and LED lamps to use labeling on consumer packaging to help customers choose the most efficient product for their needs. The labels will encourage purchasers to think about lumens—the measure of brightness—and the amount of light they want for a particular use, rather than the traditionally-used watts, a measure of energy consumed. An example of the label is shown in Figure 1. Figure 1. FTC Lighting Facts label showing the front, the back, and a special back label for mercury containing lamps. Credit: FTC Lighting Facts label. Standard incandescent lamps are the most common lighting source for homes; however, they are quite inefficient. They convert only 10 percent of the electricity to light; the rest, i.e. 90 percent, ends up as heat. Energy efficient lighting design will not only reduce the lighting portion of utility costs, but can also affect HVAC loads and costs. Many advances have been made, and are continuing to be made in the lighting industry with regard to energy efficiency. Several light source options and their characteristics are compared in Tables 1 and 2.
Credit: Adapted with permission from Environmental Building News. For subscription information, contact: Environmental Building News, 122 Birge Street, Suite 30, Brattleboro, VT 05301 (USA). Phone: 800-861-0954. E-mail. Also from Lighting Retrofit and Relighting, a guide to green lighting solutions. (2011) James R. Benya & Donna J Leban. John Wiley & Sons, Inc.
A 100-watt lamp does not necessarily provide more illumination than a 75-watt lamp. Watts measure energy use. Lumens measure light output. For example, a 100-watt incandescent bulb provides 1,710 lumens and uses 100 watts of energy. Its efficacy (often wrongly referred to as efficiency) is 17 lumens per watt (LPW). A compact fluorescent lamp provides similar light output, an average of 1,750 lumens and uses 28 watts. Because it provides over 63 lumens per watt, it is much more efficient. LPW is similar to “miles per gallon” for an automobile and is a measure of how effective the light source is in converting the watts or energy into light. Therefore, efficacy is how much light (lumen) is put out compared to how much energy (watt) is put in. A federal law passed in 1995 (EPAct) requires all lamp manufacturers to list the lumens and watts on the label. Lamp life is also important. Lumen values decrease over time as the lamp is operated. With incandescent lamps, this is primarily due to the deposition of tungsten from the filament on the glass bulb, thereby darkening it and reducing the transmission of light. When a standard incandescent lamp is near its end of life, it may only be providing 80% of the light it produced when new. Lumen depreciation in incandescent lamps is noted at a point that is 70% of the rated life of the particular lamp. Therefore, if a lamp was rated for 1000 hours life, then the rating point to denote lumen depreciation would be 700 hours. Fluorescent lamp life is dependant on many variables, such as lamp type, ballast type, operating environment (not too cold or too hot) and how often they are switched on and off. Light emitting diodes (LEDs) have the longest lamp life. See Tables 1 and 2 for a comparison of lamp life and other characteristics among fluorescent, incandescent, and other types of light sources. The color rendering index (CRI), measured on a scale from 0 to 100, describes how a light source makes the color of an object appear to human eyes and how well subtle variations in color shades are revealed. The higher the number, the more natural and vibrant an object or color will appear. Standard incandescent bulbs have a CRI of 95+. A lower CRI means that some colors will look unnatural under the artificial light. The old standard cool white fluorescent lamp has a poor CRI of 62, which is why people complained in the past that fluorescents gave false colors. Today, many kinds of fluorescent lamps have a much higher CRI—80 and above—so check the packaging. It’s not surprising that CRI is important for merchandising. Figure 2. 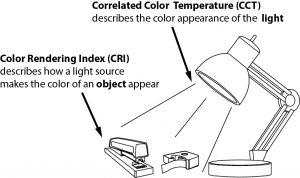 Correlated color temperature (CCT) and color rendering index (CRI). [Click to view full size image.] Credit: Miller, C., Sullivan, J., and Ahrentzen, S. (2012). Energy Efficient Building Construction in Florida. ISBN 978-0-9852487-0-3. University of Florida, Gainesville, FL. 7th Edition. 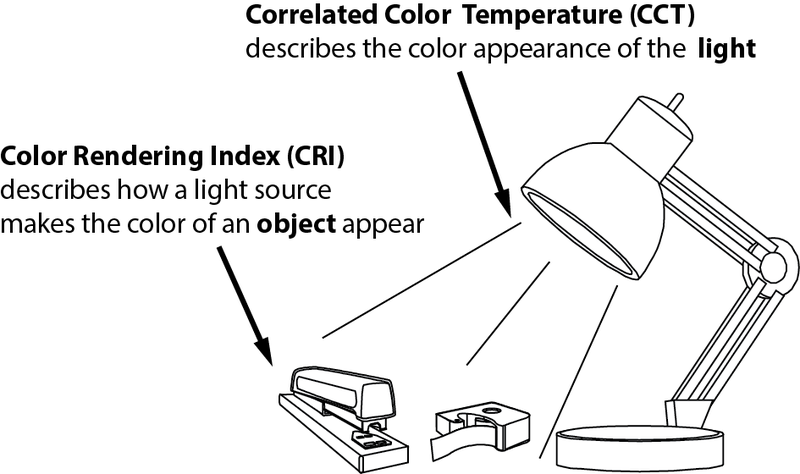 The correlated color temperature (CCT) measures the appearance of the light itself, or how warm or cool a light seems. Color temperature is another common complaint about fluorescent lighting. Often, fluorescent lighting is considered harsh compared to incandescent lighting. People perceive some light as “warm”—with more reds/oranges/yellows—and other light—with more blue—as “cool.” (See Figure 3.) A low CCT—below 3100 K—is a warm white light. For instance, standard incandescent bulbs have a CCT of 2500. Many fluorescents have a CCT of 2950 and provide the same warm, white light that an incandescent bulb produces. Figure 3. Some typical color temperatures. [Click to view full size image.] Credit: Miller, C., Sullivan, J., and Ahrentzen, S. (2012). Energy Efficient Building Construction in Florida. ISBN 978-0-9852487-0-3. University of Florida, Gainesville, FL. 7th Edition. Table 1 compares the efficacy, CRI, and CCT, etc. of a few of the many kinds of lamps that are available. As this table shows, there are many alternatives. Choose the combination of efficiency, lamp life and cost, color rendering, and color correlated temperature that best fits each application. Currently, fluorescents offer the greatest range of tried and tested alternatives to the standard incandescent or halogen bulb. However, LEDs, which are part of a comparatively new class of lighting called solid state lighting (SSL), are beginning to play a greater role. Remember CRI and CCT. In places where color does not matter, such as the garage, the very inexpensive traditional fluorescent lamps will usually be fine. In a living room or bathroom, on the other hand, color is important. ENERGY STAR® energy-efficient fixtures and lamps for areas of high continuous lighting use, such as the kitchen, sitting areas, and outside the home for safety and security. Task lighting for specific activities such as working at a desk, on a kitchen counter, or in a workshop. Accent lighting for areas that need more light. This enables the overall level of lighting in a room to be reduced. Timers, motion sensors, and light-sensitive switches for exterior lighting. Using sunlight as the light source (daylighting) in areas normally occupied during the day. However, choose windows that have low solar heat gain. Solid-state dimmers and multilevel switches that allow variable lighting levels. Occupancy sensors that monitor human presence, turning light fixtures on the moment someone enters a room and off automatically after they leave. Ambient lighting provides illumination for performing routine daily activities—such as watching television—and safety—in a hallway, for example. Low light levels are usually fine for ambient lighting. Indirect lighting, or uplighting, where light is directed to the ceiling and upper part of the walls, is a specific technique commonly used to provide ambient lighting or lighting where glare can be a problem. It provides a very evenly distributed light and helps prevent reflected glare from glossy surfaces, such as televisions. Activity lighting provides illumination for a specific task, such as reading or woodworking. The light needed will vary by task and by how long the task is performed. Sewing for a few minutes does not require as much light as sewing for an extended period of time, for example. Accent lighting focuses light on an object or an area in the room to emphasize it. Accent light is used to draw attention to artwork or interesting architectural details. Wall washing is similar to accent lighting because it, too, draws attention. It can also provide ambient lighting because the light is reflected off the wall. Special purpose lighting refers to such uses as medicine cabinets and under-cabinet lighting in the kitchen. Once the amount of lumens that are needed is determined, choose a luminaire that uses the fewest watts. In designing a lighting plan, consult with knowledgeable professionals about optimum lighting levels, CCT, CRI, and different types of fixtures and lamps. In general, commonly installed luminaries include ceiling-mounted, suspended, recessed, cove, soffit, valence, wall-mounted, and furniture or cabinet-integrated. Of these, recessed lighting can be used for almost every lighting need. However, these fixtures are often installed into the ceiling and are notorious for air leakage, which can greatly increase heating and cooling costs. Some argue that it is virtually impossible to install a recessed fixture so that it does not leak air. Make sure that the housing—or “can”—does not have perforations in it (i.e., that it is airtight). These perforations are a direct pathway for losing heated or cooled air. Look for a housing that meets the energy code air infiltration standards. Further, insulation cannot come into contact with many recessed fixtures. Look for housing types rated IC, and follow manufacturer installation instructions. Additionally, install a luminaire that uses fluorescent lamps or LEDs to further reduce energy use. Long-lasting lamps (10 year lifetime) are convenient for difficult-to-reach recessed cans in cathedral ceilings; be sure they are labeled for such use. Look for opportunities to incorporate solid-state lighting. Light pollution is largely the result of bad lighting design, which allows artificial light to shine outward and upward into the sky—where it’s not wanted—instead of focusing it downward, where it is. Of all the pollutions we face, light pollution is perhaps the most easily remedied. Simple changes in lighting design and installation yield immediate changes in the amount of light spilled into the atmosphere and, often, immediate energy savings. Quality lighting can reduce electricity consumption and thereby reduce carbon dioxide emissions. Many cities have enacted light pollution laws to protect the quality of life in their community. Some lighting codes, in use in other cities, now include the concept of lighting zones to distinguish different types of lighting areas. For example, parks, wildlife refuges, and areas near astronomical observatories require much lower levels of lighting than in city centers. Shielded or “Full Cut Off” light fixtures that are properly aimed downward are a must. This will solve most light trespass and glare problems, and it will significantly reduce sky glow. Glare always reduces visibility, which reduces traffic and personal safety. For driver, cyclist and pedestrian safety, lights should be shielded and aimed so that they are not directly visible from the roads, alleys, and pathways, and so that they do not obscure traffic signs or cause confusion. See the International Dark-Sky Association standards for outdoor lighting for more information.